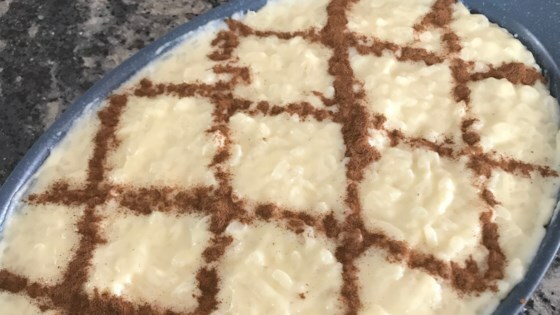 "My mom would always make this delicious, creamy rice pudding when we were kids. If a thicker rice is desired, increase rice to 1 1/4 cups and add another egg. Sprinkle with cinnamon." In a large saucepan over high heat combine sugar and milk. When bubbles form at the edges, stir in rice and reduce heat to medium-low. Cook 60 minutes, stirring often, until rice is tender. Do not allow to boil. Remove from heat and vigorously stir in beaten eggs, a little at a time, until well incorporated. Serve warm. I've made this recipe many times and always get compliments on it. I sometimes add a bit of vanilla too. It didn't do anything for me. I was really grossed out by adding the egg once it was removed from the heat. It's just missing something. Some lemon peel maybe?? My mom use to make this but she never added vanilla. if you add lemon peels, it takes away the strong taste of the egg. If you like rice pudding, this is the stuff you want! As you can see in my photo, I served it to company with strawberry and kiwi slices, garnished with mint. Delicious! My mom always added lemon rind to her arroz doce so I added the rind from one lemon to this recipe. Cut, not grated. Remove the rind before placing the rice into the serving dishes. Bellisimo! My va-vo used to make this classic dish almost the same way! Excellent! I added a lemon peel just like mom used to and sprinkle of cinnamon on top too!! All the memories...ty for posting this!